Your old pal The Primal Root here, bringing you the bizarre best of the strange, forgotten and dismissed here on the Rotten Reviews. And boy, this month do I have one Hell of a movie to show you. We’re taking a look at 1986’s multiple killer slasher oddity, Neon Maniacs, a film so epic and expansive they couldn’t even be bothered to explain anything. It features 12 creatures dressed like Village People rejects who trot around down town San Francisco after dark to kill people…cause apparently that’s all they do. 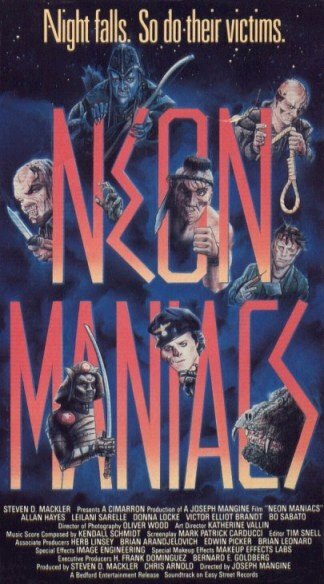 Neon Maniacs features a great cast of obscure slasher film actors and actresses that only those truly devoted to Trash Cinema (aka: geeks-like myself) would get excited over. Two of which are from the Friday the 13th series! SCORE! And make sure to stick around for the old Neon Maniacs Safety Training video left over from the 50’s I managed to track down. It sheds some light on how to deal with these blood sucking freaks. Hey, you can never be too careful. So enjoy this latest Rotten Review with someone you love. Make sure to keep a beverage handy as well.